"As you know — our longtime drummer, friend, and brother that is the almighty Daniel Svensson has left IN FLAMES to pursue other dreams. He is still with us in spirit when we write our music, in our lives, and someone whom we will cherish forever. We are truly grateful for the nearly 20 years that Daniel devoted to IN FLAMES", the band states. "Because of each other, we’ve grown exponentially as musicians and brothers. Our 12th studio album is the first we will release without Daniel since 1998, so entering the studio this time around was a bittersweet moment. At the time, we didn’t know who could even replace him, and making new music without him felt strange. We were missing a piece of IN FLAMES." "From February to April of 2016 we recorded our newest album, “Battles” with legendary producer, Howard Benson. Howard and his team pushed our boundaries and kept our energy high every day while navigating us through a new process. Suddenly, we felt at home. Howard introduced us to one of his trusted and so talented studio drummers, Joe Rickard. Joe had formerly been a member of Grammy nominated RED, toured with numerous bands such as Islander and RED, and has played drums on many successful albums for artists such as RED, Vamps, Starset, Brian “Head” Welch and our very own “Battles”. Joe had such natural talent behind the kit; it seemed effortless. Once we witnessed him laying down drums to our own songs with parts we couldn’t have imagined better ourselves — we knew we had to have him join IN FLAMES. During nearly two months recording in Los Angeles with Howard Benson, Joe quickly became not only a musician that we highly respected, but also a friend. We are proud and excited to finally announce that Joe Rickard will be taking over the drums for In Flames. We feel by adding such a talented and pure musician to our band and brotherhood that we are doing Daniel a great justice in ensuring his hard work and talent will continue on. Daniel, thank you for your incredible talent and time dedicated to this band and family that is In Flames. We are so honoured to have had the privilege of playing music with you all of these years and we couldn’t have achieved so much without you. 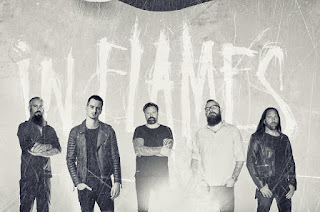 Jesterheads, please welcome JOE RICKARD to IN FLAMES and make him feel welcome! We will see you all out on the road very soon."